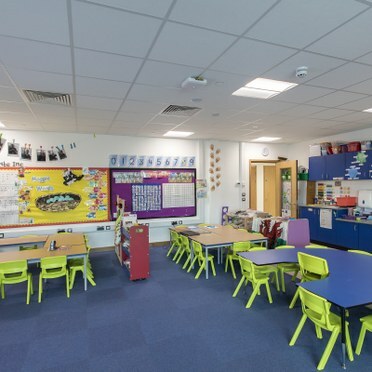 When Pembrokeshire County Council in Wales decided to build a new primary school in the town of Milford Haven, its aim was to create a flexiblemodern learning environment. The £12 million, 515-pupil Gelliswick Primary School replaces two older schools, and is one of several being built under the 21st Century Schools Programme, a £150 million initiative by Pembrokeshire County Council and the Welsh Government. 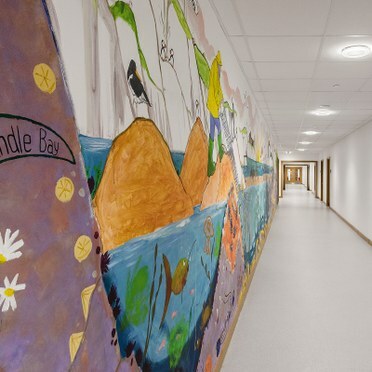 In addition to the school, the site also includes an early years unit for 60 children under five, a complex needs unit for 24 pupils and other facilities for the local community. A key requirement of the project was to create a better learning environment, improve wellbeing and attendance levels, and raise standards, as well as providing dedicated facilities for family integration. 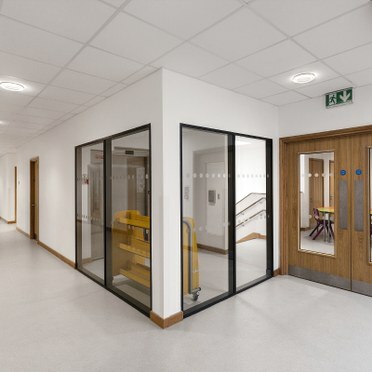 Thorn worked closely on the Gelliswick Primary School project with consultants Hoare Lea Cardiff, and M&E contractors Highadmit Projects, based in Beddau. 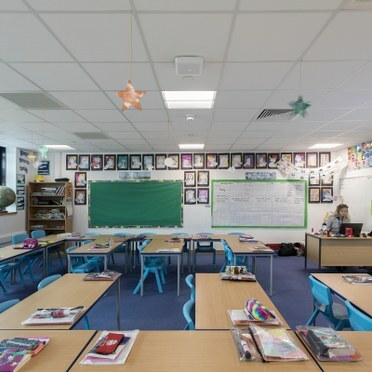 To create the desired environment, Thorn’s next-generation IQ Wave luminaires were chosen for the classrooms and offices. IQ Wave is a smart recessed LED luminaire featuring intelligent controls, optics, design and installation, creating a smooth, homogenous illuminance with no visible LEDs. Low glare (UGR 19) ensures a comfortable ambient light, while high efficacy (>100lm/W) achieves significant energy savings in comparison to traditional light sources. IQ Wave provides excellent lighting quality, high user comfort and a communicative working environment. 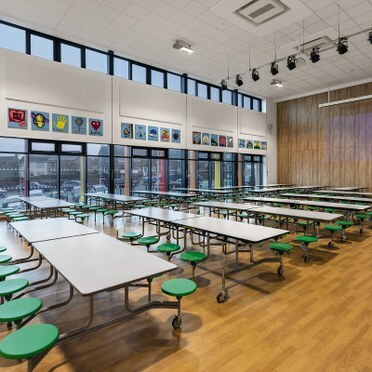 Thorn’s Chalice downlights, in the school’s corridors, enables a 60% reduction in energy usage compared to conventional fluorescent downlights. Chalice is available in a warm 3000K colour temperature, or a neutral 4000K, and its lifetime of up to 50,000 hours significantly reduces maintenance demands. 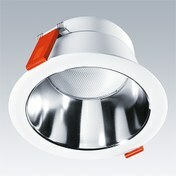 Cetus, Thorn’s recessed LED downlight sealed to IP44, illuminates the school’s bathroom areas. Thorn’s IP65-rated Aquaforce LED luminaires provide the required lighting levels in the school’s storage areas. The durable Aquaforce LED range from Thorn provides the highest level of light, efficiency and reliability in harsh wet and dusty environments, and is robust enough to withstand impact. Energy consumption and costs are reduced, and further savings come from longer maintenance lifecycles. Emergency lighting throughout the facility is provided by Voyager C, a high-performance, surface-mounted, emergency lighting luminaire with an open area optic and three-hour manual test. Voyager C can be operated in either maintained or non-maintained modes. The school’s new lighting provides even illumination with low glare, ideal for learning. At the same time, energy and maintenance costs have been significantly reduced. 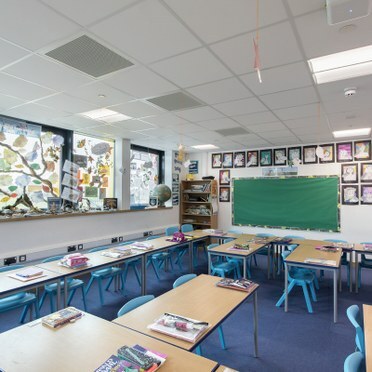 The lighting solution provided by Thorn has helpedthe school to provide the best quality education to all children in the area and the best services to the local community.